VietNamNet Bridge – Supporters' faith in the national team was shaken yesterday, Oct 24, as Viet Nam displayed an unconvincing performance in its 0-1 defeat by Turkmenistan. A large crowd of supporters came to Thong Nhat Stadium to cheer the national team in the match against Turkmenistan in the Viet Nam Football Federation Cup. Although the team's determination in the last 10 minutes of the match and five minutes of extra time kept some fans, who were already on their feet, from leaving the match until the final whistle, most of them were not satisfied. "Turkmen players' aggressive approach to the match caused a lot of difficulties for our players in ball control as well as connecting with each other," Viet Nam's head coach, Phan Thanh Hung, said. "After the break, we played better and created some chances. "However, the match was a good lesson for Viet Nam, despite the loss," he added. Meanwhile, Turkmen head coach Hojageldiyev Yazguly said: "The result was good because we had to adapt to the climate." The match was a disappointment for the more than 10,000 supporters, who expected some good attacks from the national team which had shown signs of improvement of late. Each team only had one real chance to open the score in the first half that saw the Turkmen looking better in the first 30 minutes and the tide turning in the home team's favour in the last 15 minutes. Turkmenistan's goal scoring opportunity belonged to Bayramov Vladimir who flicked Abylov Guvanch's left-wing square over the crossbar from just 5m off the goal line. On the other side, it was Nguyen Trong Hoang who earned a round of applause from the fans with his powerful shot which flew just inches over the crossbar. Just six minutes into the second half, Vladimir again squandered an excellent chance. However, only six minutes later he opened the score with an accurate header. It could have been the end for the home team in the 65th minute had Guvanch's header been a few inches lower instead of floating over the bar. 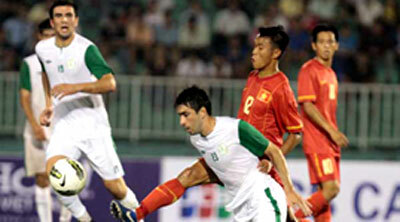 The rest of the match was controlled by Viet Nam as players flooded forwards in search of an equaliser but Turkmenistan survived due to the failure of Vietnamese strikers to capitalise on the surge.